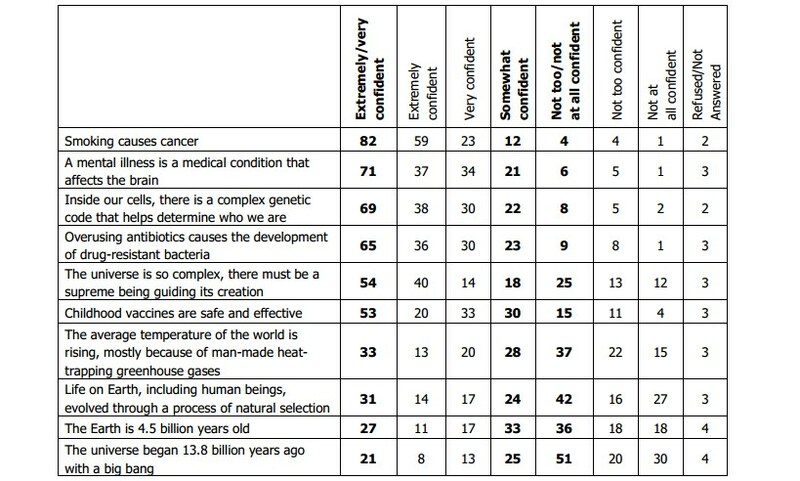 The Sorry State of America’s Science Education. It’s easy to forget that the whole world doesn’t share your view of it. With the vast trove of information that is the Internet it’s become incredibly easy to surround yourself in an echo chamber of like-minded people, lulling you into the idea that you’re part of the majority. 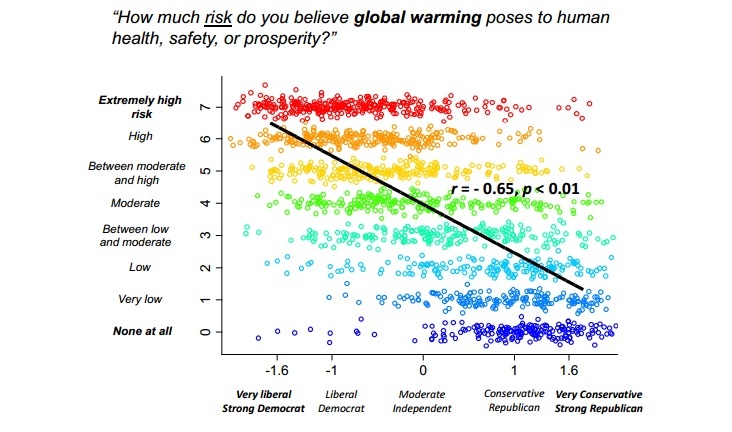 Once you’ve been in there long enough it’s easy to dismiss dissenting viewpoints as outliers, ones that shouldn’t have an effect on your perfect worldview. Of course if you have a rational mindset you’ll eventually come to learn that the world is quite unlike any echo chamber claims it to be and the reality can sometimes be quite sickening. Indeed I’ve fallen prey to it many times but none was as shocking to me as the current state of the population of the USA’s science education. The table above is taken from the AP/GFK poll which was conducted between March 20-24 of this year with a total number of respondents being just over 1000. The margin of error for the study is +/- 3.4% at the 95% confidence level which shows that the figures portrayed above are very close to the actual state of opinion in the USA on these matters. As you can see whilst some of the bigger issues have wide spread support, like smoking causing cancer and that mental illness is a medical condition, the bottom half starts to get really murky. The thing about all those statements however is that they’re solid scientific facts so there’s really no debate about whether or not they’re correct. Indeed many of these things are what should be part of a typical American education which brings me onto the next point. In the same report there’s a table labelled PPEDCUAT. (4 category) which shows the breakdown of the education levels of the respondents. Now I don’t know what I was expecting but 89% say that they have a high school education or higher which, I would hope, covers off the majority of the topics in the lower support brackets. What this tells me is that either the high school education doesn’t cover these topics, which I don’t believe is the case, or people are rejecting these arguments for one reason or another. Whilst I can hazard a guess as to why I’m sure you can figure out at least one or two factors that would be having a negative impact on those scores. I’d be interested to see how this compares to other countries as whilst I’d love to believe that Australia is the bastion of rational thinking I know that’s not strictly the case. In any case this shows just how important science outreach programs are as this survey shows just how much work there is left to be done. Hopefully over time those numbers will all trend in the upwards direction, showing that the general public’s interest in science is increasing. It definitely feels like that is the case when you compare it to say a decade ago but as these numbers show there’s always room to improve. The Sound Economics of Australia’s Education System. Australia has one of the best education systems available as evidence by our top 10 rankings for literacy, science and mathematics as well as our overall education index of 0.993, tying us for first place with countries like Denmark and Finland. While our system isn’t exactly unique in its implementation I do believe schemes like HECS/HELP are one of the main reasons that the majority of Australians now pursue tertiary education and whilst this might bring about other issues (like a lack of people in trades) it’s clear that benefits far outweigh the costs. Indeed as someone who couldn’t have afforded university without the help of the government and now has a great career to show for it I’m something of a testament to that idea. The Grattan Institute’s annual Mapping Australian Higher Education report finds that students and former students have accumulated HECS-HELP debts of $26.3 billion. This is about an extra $10 billion owing, in real terms, than in 2007. The interest bill on the income-contingent loan scheme, formerly known as HECS, is nearly $600 million a year, the institute estimates. 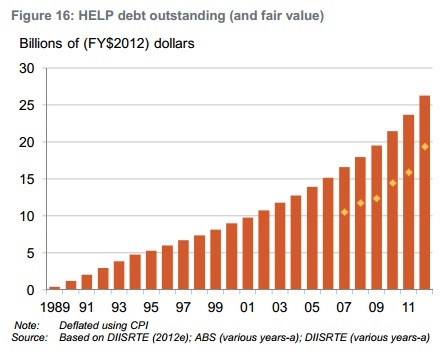 And it says HELP debt not expected to be repaid rose to $6.2 billion in 2012. The report makes for some intriguing reading and does indeed state that there’s a good 25% or so of the current student debt that’s likely to never be repaid. The reasons behind it though are interesting as whilst some would have you think that it’s due to students skipping out on their debts in way or another (ala Liberal MP Steve Ciobo) it’s in fact primarily due to students either dying or moving overseas. Now there’s not a whole lot we can do about the former (except maybe investing more in the health care sector) but the latter is a problem that’s been around for decades and I’ve yet to see a solution proposed, either from the government or the private sector. Australian graduates, especially in some sectors, suffer from a distinct lack of choice when it comes to finally finding a career once they’re done with their university studies. Whilst I might have managed to make a decent career without looking too far you have to appreciate the fact that my degree isn’t in IT, it’s in engineering, and such is the case for many graduates who try to find something in their chosen path. Usually they can get close but the chances of landing an opportunity directly in their field of study are usually pretty slim and that leads them to look overseas. I myself did exactly that not too long after I graduated and was pretty staggered at the number of opportunities available abroad that I was more than qualified for. Another point that the report makes is that student debt is seemingly sky rocketing when compared decades prior. The graph above demonstrates that quite clearly but it doesn’t give you any indication as to why this is happening. For starters Australia’s population has increased by about 5.8 million in since 1989 or about 35%. At the same time participation in tertiary education has well over doubled in this time with the vast majority having some form of tertiary qualification and 27% of all Australians now carrying a bachelor’s degree or higher. Essentially there’s been a major cultural shift over the past 2 decades towards pursuing an education through universities rather than other avenues and this is what is responsible for the increase we’ve seen. This isn’t exactly an issue considering our GDP has quadrupled in the same time frame and whilst I won’t say there’s a causative link there I’d say you’d be hard pressed to uncouple higher education rates from improved GDP figures. Realistically the issue of unpaid student debts isn’t much of an issue for the Australian government considering the wide reaching benefits that our high quality and freely available education system gives us. We still need to do something about our best and brightest moving overseas to greener pastures but it’s clear that the economic benefits of free education for anyone who wants it vastly outweighs the cost of providing it. Even if we were to erase all student debt in one year it would still be only a few percent of the total budget, something that could be easily done should there be any burning need for it to happen. There isn’t of course since the cost of servicing that debt is so low (comparatively) and there are much better things to spend that money on. I’ve always been fascinated by people who are incredibly smart and religious. To me they seem to be diametrically opposed as education goes up the evidence for God’s existence starts to come under question, usually to the point of pushing people to be either agnostic or atheist. For me it was mostly my distaste for the study of religion (I found it boring) and the ham fisted approach that my science teacher had to reconciling the Anglican school teachings with actual science. Like almost any industry IT can sometimes feel like a pretty thankless job. If you’re halfway competent at what you do people won’t notice the vast amount of effort you put in to making sure everything runs smooth and will begin to question whether they really need to keep you around. Conversely if everything isn’t running smooth it’s more likely everyone will recognize your hard work, but you’ll be spending all your time fighting fires and solving problems that need to be done urgently which isn’t the greatest thing if you like your work to be stress free. Plus the work doesn’t stop once you clock off in the afternoon since (if you’re one of the only computer guys in your family/circle of friends) people will bug you with their computer problems, begging you to provide a fix for them. The latter point though is applicable to almost any industry. Way too often when people are socializing and the topic of work comes up people’s professions seem to be an open door for people to solicit free advice from the first person to mention what they do for a crust. The doctors will get regaled with tales of various ailments, the mechanic about car problems and the IT guy will of course be barraged with all sorts of strange questions that realistically can’t be answered on the spot. Whilst I don’t shy away from telling people what I do for work anymore (I just tell them my going rate should they want me to fix their problems) it does make IT a bittersweet industry to work in sometimes, and I’m not the only one to think that. What spurred this idea was this blog post on why it doesn’t pay to be the computer guy. Boyd makes some great points in there hitting on some common frustrations that nearly every IT person has encountered throughout their career. Indeed I had found myself struggling with such problems for some time, like the lack of appreciation for the work that I did and how saying “it should work this way, let me check that” turns into “he said it would do exactly this, and it didn’t so its his fault” quicker than I could ever imagine. Still whilst I’m not going to say that much has changed in the 4 years since he wrote that post there is one thing that I learnt from my time in project management that I feel could solve at least half of the problems that he faced there. That thing is expectation management. You see when people expect the world of you it’s in our nature to not turn them down. It’s really quite flattering to have people come and ask you for help and the more you’re able to do for them the more they will expect of you. For us IT folk this has a habit of spiraling wildly out of control since 90% of the problems users encounter are 5 minutes on Google away from being fixed, so expectations eventually reach levels that no one will be able to live up to. Thus you end up being placed on a pedestal and users will look to you first instead of attempting to solve the problem first. They then expect you to be the answer to all their problems, which seems to be the root of many of Boyd’s complaints. The best way to fight this problem is to educate the users on what they can do to help themselves out, empowering them. Back when I used to work as an IT technician for servicing people’s computers in their homes I’d usually spend a good hour of my time there explaining to them what was wrong and how they could go about fixing it themselves in the future. You’d think this would be bad for business but it wasn’t as many customers would recommend me based on my services, with a good 20% of new customers coming from referrals. Additionally when they did hit a problem they couldn’t fix themselves they were far more appreciative of my skills when I returned, knowing the effort that went into it. We IT people could also do with eating some humble pie once in a while. I can’t tell you how many times I’ve been asked something that I know nothing about and I’ve straight up said “I don’t know” to a user’s face. Their reaction is always of surprise since it’s unusual for anyone (let alone an IT know-it-all) to admit they have no idea about something you just asked about. It’s not easy I’ll admit and your pride will take some hits from being so brutally honest about your limitations but it will knock you off that pedestal the users have put you on and they’ll be far more likely to treat you like a human rather than some IT deity. If a workplace doesn’t value this kind of honesty then I’d recommend moving on, unless you like the position you’re currently in. There are a few points Boyd makes however that can’t be simply managed away like the constant skill devaluation and getting asked the same questions again and again, but you life as an IT worker can be a whole lot more tolerable when you start molding people’s expectations of you to more closely align to reality. It’s not easy sometimes, especially when it feels like you’re giving your boss reasons to fire you, but in the end you’ll be better for it and you’ll be far more appreciated for the work you do. There’s No Substitute For Fundamentals. When I look back at those 4 long years I spent at university I always feel a wide range of conflicting emotions. Initially it was one of bewilderment as I was amongst some of the smartest people I’d ever met and they were all passionate about what they were studying. During my second year it turned to one of pride as I began to find my university legs and excelled at my chosen specialities. However the last 2 years of university saw me turn on the career I had once been so enamoured with, questioning why I should bother to languish in lecture halls when all of what I learnt would be irrelevant upon completion. Still 4 years on from that glorious day when I walked out of parliament house with my degree in one hand I still value my time there and I couldn’t be sure if I had the chance again would I do it any differently. Unfortunately for me my predictions of most of the knowledge being irrelevant outside of university did ring true. Whilst many of the skills and concepts I learnt still stick with me today many of the hours spent deep in things like electronic circuits and various mathematical concepts haven’t found their way into my everyday work life. I wholly lay the blame for this at myself however as straight out of university the most lucrative career I could land was in IT support, not computer engineering. This is probably due to the engineering industry in Canberra being none too hot thanks to the low population and high public service employment rate but even those who’ve managed to find jobs in the industry quickly learned that their theoretical university experiences were nothing compared to the real world. What university did grant me was the ability to work well from a fundamental base of knowledge in order to branch out into other areas. Every year without fail I found myself trying to build some kind of system or program that would see me dive back into my engineering roots to look for a solution. Most recently it has been with Lobaco as I’d barely touched any kind of web programming and had only limited experience in working with real 3 tiered systems. Still my base training at university allowed me to ask the right questions and find the right sources of information to be able to become proficient in a very short space of time. Flush with success from coding and deploying a working system on the wider Internet my sights turned to something I had only a cursory experience with before: mobile handsets. A long time ago I had tried to code up a simple application on Windows Mobile only to have the program crash the simulator repeatedly and fail to work in anything meaningful way. Still being an iPhone user and having downloaded some applications of questionable quality I thought it couldn’t be too hard to pick up the basics and give it the old college try. Those of you following me on Twitter would have noticed how there was only one tweet on iPhone applications before I mentioned HTML5 as the potential direction for the mobile client, signalling that I might have bitten off more than I could chew. Indeed this was what happened. Attempting to stumble my way through the other world that is Objective-C and Xcode was met with frustration on a scale I hadn’t felt in quite a while. Whilst the code shares a base in a language I know and understand many things are different in ways I just hadn’t fathomed and the resources online just weren’t the same as what I was used to. I managed to get a few things working but doing simple things like say incorporating the pull to refresh code into my own application proved to be next to impossible and still elude me. After a while though I began to think that I was missing the fundamentals that I had had when developing for other platforms and dreaded the idea of having to drudge through one of the millions of iPhone programming books. Right in the depth of my plight I came across this Slashdot article on someone asking which mobile platform they should develop for. Amongst the various responses was this little gem that pointed me to something I had heard of but never looked at, iTunesU. I had known for a while that various universities had been offering up their lecture material online for free but I hadn’t known that Apple had integrated it into their iTunes catalogue. Searching for the lecture series in question I was then presented with 20 lectures and accompanying slides totalling several hours of online content. With the price being right (free) I thought nothing of downloading the first lecture to see if there was anything to gain from this, and boy was there ever. Whilst the first 30 minutes or so were general housekeeping for the course itself the last 20 minutes proved to be quite insightful. Instantly I knew that the way I was approaching the problem wouldn’t work in Apple’s world and I needed to develop a fundamental base of knowledge before I could make any meaningful progress. These lectures have proved to be an invaluable source of knowledge and proved to be instantly valuable, helping me develop a base application that resembles what I hope to one day release to the world. It’s this kind of knowledge dissemination that will disrupt the traditional education frameworks. The amount of information available to anyone with an Internet connection is unfathomable and those with a desire to learn about a particular subject are able to do so without any limitations. Back when I started at university anyone wanting to attend the lectures had no choice but to be physically present at each lecture. Sure you could probably grab the lecture notes but they’re a poor substitution for actually being there, especially when the classes are as useful as the ones provided by Stanford. They won’t make you an iPhone programming genius on their own but if you’ve done any sort of programming before you’ll quickly find yourself becoming vastly more proficient than you would bumbling around blindly in the Xcode IDE as I did. In the end I realised there’s really no substitute for starting with the fundamentals and working your way from there. I had assumed that based on my extensive past programming experience that learning an new language and IDE would be a walk in the park. It took me several days of frustration to realise that I was using my Microsoft hammer to bash in Apple nails and that wasn’t getting me anywhere fast. Just an hour spent watching a very basic lecture proved to be more insightful than the hundreds of Google searches I had done previously. It’s still early days for me as an iPhone programmer but I’ve got a feeling that the next few weeks spent coding will be much easier than the week that has led up to it.